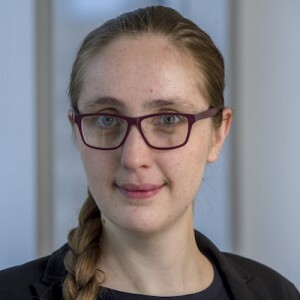 Maaike Verbruggen is a PhD Researcher at the International Security Cluster of the Institute for European Studies at the Vrije Universiteit Brussels. She specializes in emerging military and security technologies and arms production, trade, and control. Her PhD is on military innovation in autonomy, but she also works on drones/unmanned systems, biotechnology and human enhancement. <p>The cross-cutting issues fascinate her. How do different arms control regimes deal with changes in Science & Technology? How will the Fourth Industrial Revolution affect arms production, diffusion and diversion? How do states try to keep a grip on defence innovation, in a time where transnational civilian companies are at the forefront of innovation? How will emerging military technologies change the environmental impact of warfare? As a result, she is involved with a wide range of military technologies, from surveillance to Small Arms and Light Weapons, and from conventional weapons to Weapons of Mass Destruction. The Mapping the Development of Autonomy in Weapon Systems report presents the key findings and recommendations from a one-year mapping study on the development of autonomy in weapon systems. The report aims to help diplomats and members of civil society interested in the issue of lethal autonomous weapons (LAWS) to improve their understanding of the technological foundations of autonomy, and obtain a sense of the speed and trajectory of progress of autonomy in weapon systems. It provides concrete examples that could be used to start delineating the points at which the advance of autonomy in weapons may raise technical, legal, operational and ethical concerns. The report is also intended to act as a springboard for further investigation into the possible parameters for meaningful human control by setting out some of the lessons learned from how existing weapons with autonomous capabilities are used. In addition, it seeks to help diplomats and members of civil society to identify realistic options for the monitoring and regulation of the development of emerging technologies in the area of LAWS. Article 36 of the 1977 Additional Protocol to the 1949 Geneva Conventions imposes a practical obligation on states to determine whether ‘in the study, development, acquisition or adoption of a new weapon, means or method of warfare’ its use would ‘in some or all circumstances be prohibited by international law’. This mechanism is often colloquially referred to as an ‘Article 36 review’. This SIPRI report presents the authors’ key takeaways from a conference convened by SIPRI to discuss the importance of, and challenges associated with, Article 36 reviews of the legality of weapons, means and methods of warfare that are based on three emerging fields of technology: cyberwarfare technologies, artificial intelligence and robotics, and human enhancement. It establishes that although these three technology areas are at various levels of maturity (from mature to still emerging and experimental), it is beyond dispute that they will have a dramatic impact on the future of warfare as they all have the potential to fundamentally change the way force is applied, and critical decisions are made, on the battlefield. The report also finds that despite their technical and operational differences, the military applications derived from these technology areas raise similar challenges as far as the conduct of Article 36 reviews is concerned.